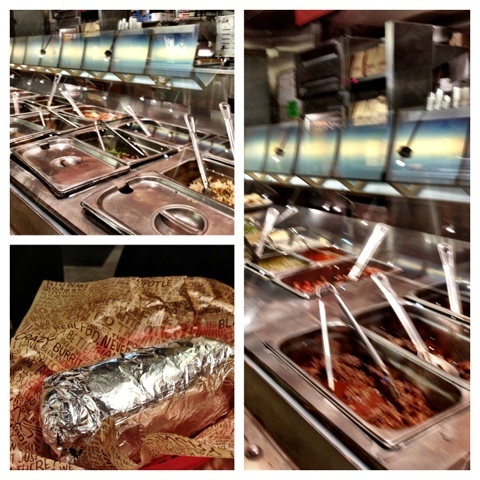 I first stepped foot into a Chipotle restaurant over ten years ago in the city of Madison, Wisconsin. I was a first year grad student and had enough of my friend Bhavesh tell me how many burritos he'd eaten that week. I had to try it out for myself. There was only one problem, I'd never had a burrito quite like this before. In Western New York we grew up eating Mighty taco. There were few other options when it came to quick tacos. Their menu consisted of soft and hard tacos, filled with beef, cheese, sour cream and "Mighty sauce." Whatever that was. During my college years, at UB in WNY, a burrito place opened up boasting burritos the size of your head. Being of the female persuasion, that didn't really appeal to me. My guy friends were happy to go there and eat six pounds of runny beans, poorly cooked meat and scorched cheese but I begged off and stayed home those nights. With grad school came a broadening of my palate and the introduction of healthy burrito options. Bhavesh dragged us all to Chipotle, where he really did eat five burritos a week, and introduced us to what would become a weekly treat. Sometimes twice weekly when we had late exams and only time for one meal. Chipotle has really spread across the country since my first visit back in 2003. Even Amherst, NY now boasts a location and they're always the last to get anything good! I have gone from solely eating soft tacos, to only getting the spiciest fajita burrito. After the advent of the online calorie counter my order swiftly switched to the chicken salad and these days I'll go back and forth between a salad and a bowl. I'm sure your own ordering process has changed through the years too. 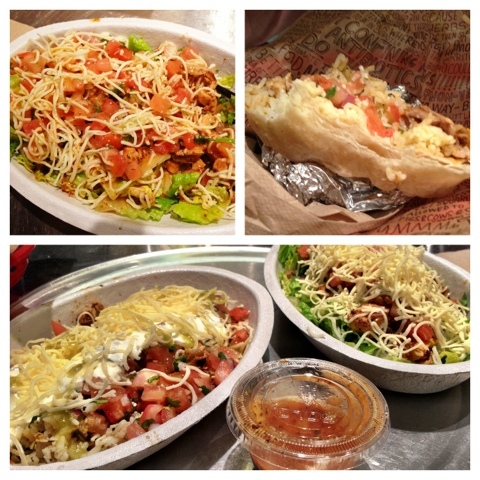 I was more than happy to have Chipotle as the first restaurant on my war list. bf and I go there a few times a month and my coworkers regularly visit for lunch. 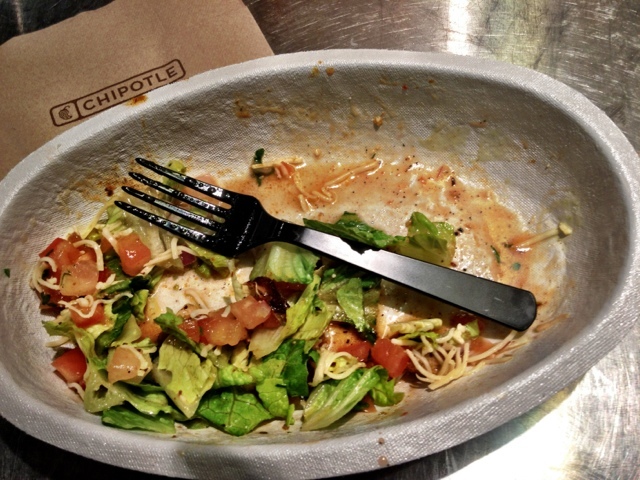 I could definitely go for a burrito bowl or salad without the long drive! I decided to try and recreate my two go-to dishes for this challenge. Here's the verdict. First, it took forever to prepare everything that I needed to make these two dishes. I made three salsas, salad dressing, chicken marinade. I prepped and chopped lettuce, tomatoes, untold numbers of jalapeño pepper and squeezed more limes than I can count. I actually ran out of limes and had to go back to the store for more. I really could have used a staff to help me prep everything. I planned on making this meal for dinner Monday, so I spent two hours on sunday afternoon doing all the prep work. Next, dinner came together really quickly Monday night, though I nearly drove us out of our apartment. The marinade for the chicken smelled wonderful, but when the chicken came in contact with the grill pan - it was like I set off a pepper bomb. BF and I were both coughing because of the spiciness in air. Maybe grill your chicken outside, or you'll this the police have sent the seat team to your house. Lastly, adobo seasoning is not the same as adobo sauce. I looked everywhere for a jar of adobo seasoning. I knew it existed because my grocery list app had it programmed into its memory. However, after six different grocery stores I had to give up. Maybe I need to locate a well stocked Hispanic grocery in my area? I wound up buying a jar or chipotle peppers in adobo sauce and fishing out he sauce I needed. 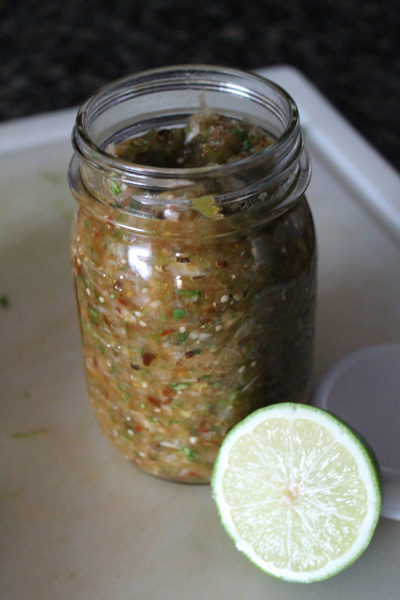 You can totally cheat on the prep work and buy your favorite mild salsa or salsa verde. 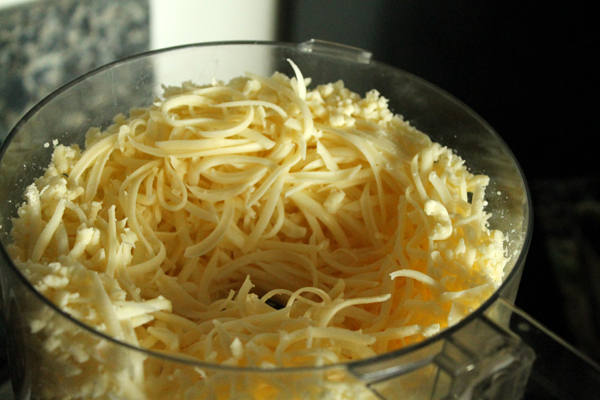 I even shredded my own cheese mixture, which you could skip and buy a pre-shredded Mexican-style cheese blend. For the Chipotle flavor though, you can't skip marinating your chicken, making your own fresh corn salsa, tossing your rice with lime juice and blending up a batch of their salad dressing. At least make the salad dressing, after a bit of tweaking of some other recipes I found - it's almost like being there. 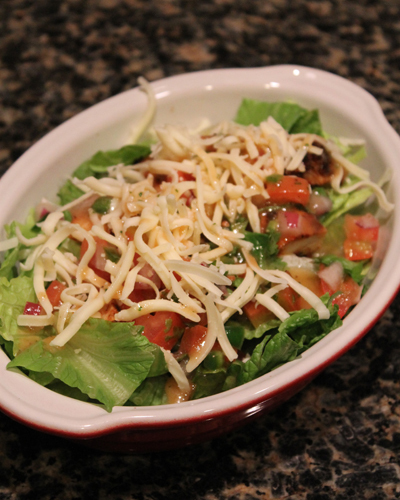 Chipotle recipes - These have all been adapted from so many different "Copy-cat" recipes online. I changed them all a little to try and get as close as possible to the real thing. Be sure to go out and get yourself a bottle of green Tabasco sauce too, because it isn't complete without a dash of heat! Turn on your oven broiler. Place tomatillos, onion quarters, garlic cloves and peppers 4-5 inches below the broiler. Broil for 5 minutes, turn the vegetable over and broil for another 5 minutes. Remove from the oven and let cool for 10 minutes. Peel the charred skin from the peppers, chop in half and remove the seeds. Combine all of the ingredients except the salt in a food processor or blender. Pulse to combine, leave the salsa a little chunky. 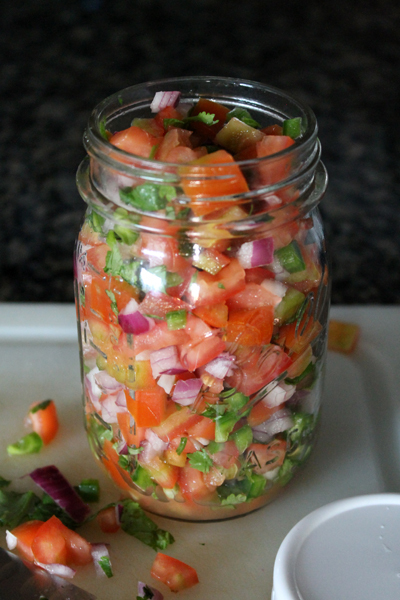 Give the salsa a taste, season with salt if you desire. 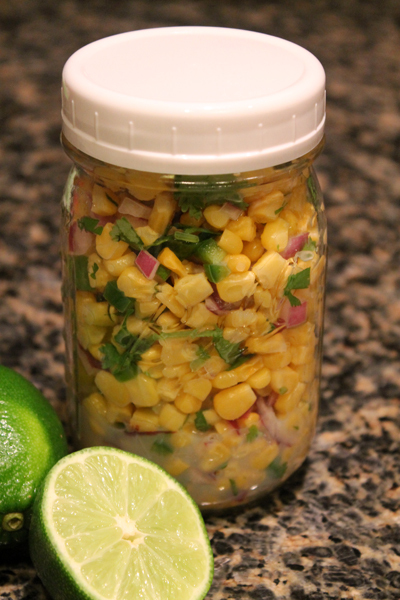 Transfer to an air-tight jar and keep in the fridge. Combine all ingredients in a large bowl and toss to combine. Transfer to an air-tight jar and store in the fridge. Place cheese blocks in the freezer for 10-20 minutes. This will make it easier to shred. Shred and combine both cheeses. So simple! Pour 1 cup brown rice into 2 cups water. Bring to a boil then lower heat to low. Let simmer for 40 minutes. 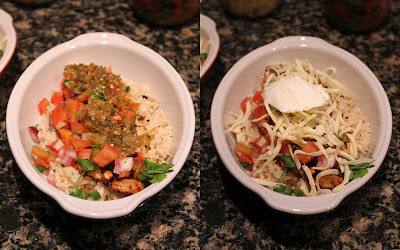 Once the rice is tender and the water is absorbed, add citrus juice and cilantro. Toss to combine. Combine all ingredients and transfer to an air-tight container. Store in the fridge for 1-2 hours before serving. Add boiling water to dried ancho chilies and let hydrate for 2 hours or up to overnight. Combine all ingredients in food processor or blender and transfer to a large bowl. Poke chicken breasts with a fork and pierce all over. Add chicken to the marinade and toss to coat. Cover bowl with plastic wrap and let sit in the fridge overnight. When ready to cook. Remove chicken from the marinade and shake off excess bits of pepper. Grill in a well-ventilated area! Combine first six ingredients in a blender. Pulse to combine. With blender running, slowly stream in olive oil. Serve over any salad for a tangy and sweet take on your usual salad.